London-based artist Lena Peters has used the ceramic medium to nurture her passion for history and nature. These elements combined with her interest in folklore and mythology mean that her work dances between the real and the unreal, creating illustrative objects which work to embody a narrative. 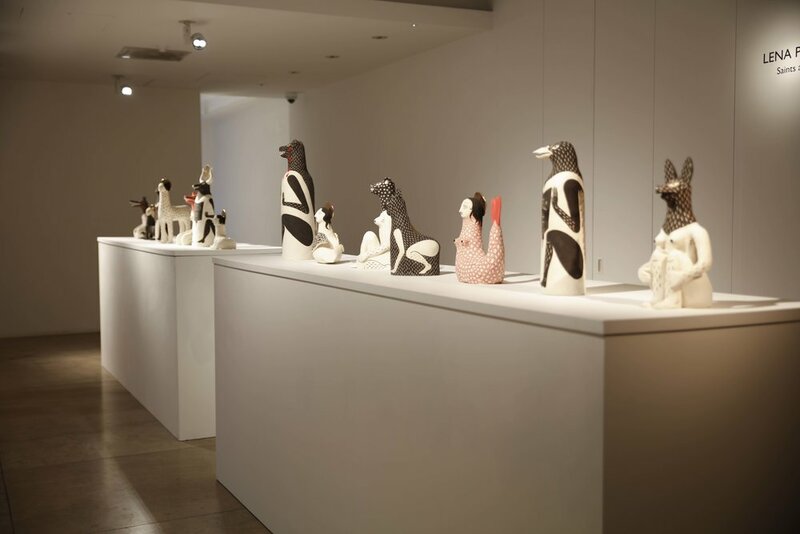 ‘Saints and Spirits’ sees a strange menagerie of shrine statues, evoking folk beliefs and household worship from across the world. It develops from her initial collection ‘Secrets of the Hidden North’, which imagined the results of an archaeological dig in the Northumberland National Park. Ranging across continents and combining pagan and primitive beliefs with Christian iconography, the figures are part of a cadre of non-canonical Saints, conjured from the stories and animal symbolism of various peoples. Following her graduation from Central Saint Martins in the Summer of 2017, Peters has experienced a swift rise. Spotted at her degree show, Peters then joined the group exhibition ‘Vases & Vessels at David Gill Gallery in November 2017, curated by Gianluca Longo. This collection of works emerges from a residency offered to the artist by David Gill. Recognising Peters’s desire and ability to expand on her emergent artistic portfolio, Gill proposed a residency that would support her to work full-time on a new body of art.